As an Electronics Technician, you work on all kinds of kit, vehicles and weapons including communications systems and medical equipment. You will be exceptionally well trained, completing first a basic and then an advanced apprenticeship. A degree in engineering is obtainable later in your career, as well as membership of professional institutions. You will be an expert on the Army’s most up-to-date technology, gaining experience in electronics, lasers, robotics, thermal imaging systems and more. You will build a career, travel the world and make friends for life. Maintain and modify a vast array of military equipment. 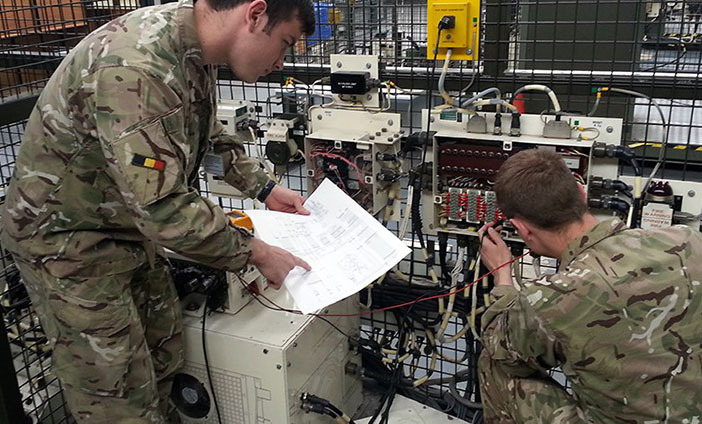 Gain experience in areas including electrics, communications systems, weapons systems, radar and lasers. Work in a diverse range of challenging environments. Work on some of the most up to date technology fielded by the British Army. Then it’s off to the Defence School of Electronic and Mechanical Engineering at MoD Lyneham. Over the next 63 weeks, you learn how to look after, fix, inspect and adapt all kinds of equipment. You will also be taught to drive and gain your licences in Car and HGV. Earn £15,230 during training. When your Initial training is finished, and you join your unit as a Craftsman your pay will rise to £18,859. “I started with the Royal Dragoon Guards in Germany, maintaining the Challenger 2 Main Battle Tank, Warrior Fighting Vehicle and CVR(T). I deployed on exercises around the world and went to Iraq. I was then assigned to 2 Field Company REME, Bielefeld, Germany. There, I maintained radios, before deploying to Afghanistan. Afterwards, I completed my NVQ 3 training and was assigned to BATUS Canada. There, I maintained the Challenger 2 tanks – and got to skydive, surf and ski. I then spent six months in Kenya maintaining radios again. Currently, I’m on an Artificer course in order to promote and gain a degree."